One theory that I have seen floating around is that the "high" Treasury debt levels will prevent the Fed from raising interest rates. As someone who is in the "secular stagnation" camp (although I dislike the term), I can think of a lot of reasons why interest rates could stay low. But the level of debt is not one of those causes (as my earlier article noted, the high debt level is a consequence of slow growth). That said, the Fed has put itself into a position that it cannot hike rates extremely rapidly without paying a political cost. 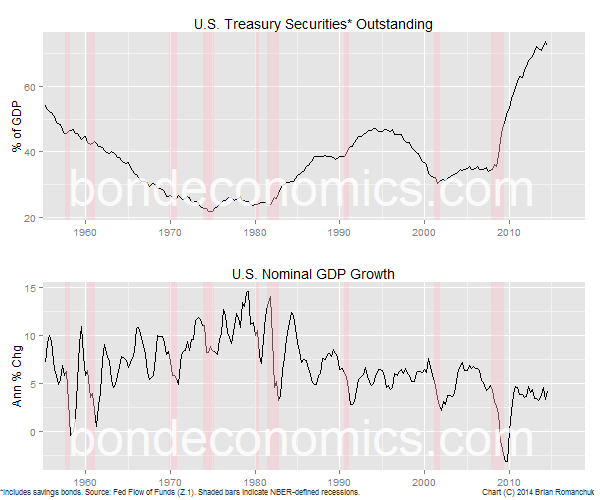 When a modern Welfare State experiences slower nominal GDP growth, the debt/GDP ratio rises rapidly. This can be seen by modelling the financial flows in a Stock-Flow Consistent Model. The usual Central Bank reaction to slower nominal GDP growth is to lower the policy rate, leading to lower bond yields via the rate expectations view of bond yield formation. Correspondingly, the regression results on historical data that he finds in his article are not surprising. This does not have predictive power, however, unless one subscribes to the discredited view that high debt-to-GDP ratios cause lower growth. Another reason based on economic analysis that interest rates have to stay low is what is now being referred to as the "Neo-Fisherite" view - raising interest rates causes higher inflation. This is of course the opposite of what mainstream economists at central banks believe. It could be caused by increased interest income allowing for increasing spending power, which was historically viewed as a driving factor behind inflation. For further reference on this topic, the following external articles appear useful. Nick Rowe has a number of recent articles at 'Worthwhile Canadian Initiative' on this topic, explaining why the 'Neo-Fisherite' view is not entirely correct, as he argues that the effect is driven by the monetary base, Here is one. 'Lord Keynes' gives a good summary of Post-Keynesian views on how interest rates affect the economy. Warren Mosler, one of the key Modern Monetary Theory authors, has written a fair amount explaining the 'Neo-Fisherite' view (without using that term). In any event, the Fed is not "Neo-Fisherite", and so this debate will not affect their interest rate decisions. A final reason one could suggest is political - that interest spending is "too high" and politically unacceptable. Given the outbursts that occur around the debt limit, such an effect may exist. That said, it makes no sense economically - the U.S. Federal Government in aggregate can create U.S. dollars at essentially no cost (other than printing expenses), and so it has no reason to care about purely financial concepts like "interest cost". Therefore, I cannot rule out such dubious logic being followed by policymakers, but at the same time, I would want to be long duration solely based on a theory that policymakers will act in an irrational fashion. Given the Fed's status as a central bank, it makes little sense to worry about its solvency. But it has a balance sheet like any other economic entity, and it is supposed to follow rules guiding its behaviour. Its latest wave of Quantitative Easing purchases has created a constraint on its behaviour as a result of these institutional rules, although this constraint appears quite weak. For example, the Fed would be very uncomfortable hiking the policy rate to 6% in 2015. That said, such a scenario only figures in the fantasies of bond bears. The Fed is not an institution that normally has to worry about losing money. It has a large balance sheet of interest-bearing securities, although it is stuck with the albatross of gold holdings for historical reasons. On the liability side of its balance sheet, it generally did not pay interest (the liabilities were dominated by currency - Federal Reserve Notes - and required reserves). Additionally, it has flexible mark-to-market rules, and so it can hold bonds to maturity without recognising temporary valuation losses. Now that the Fed pays interest on excess reserves, it is now possible for the Fed to lose money - it just has to pay interest at a rate above the average coupon on its asset holdings. (To a certain extent, it can dodge the mark-to-market losses - that would crush private sector portfolio managers - as a result of the accounting rules it follows.) This does not pose a financial problem to the U.S. Federal Government in aggregate - the U.S. Treasury can just inject 'capital' into the central bank without requiring any real resources on the Treasury's part. However, this act appears to require Congressional approval, and many politicians in the Republican majority have been enraged by Fed policies. The process of capital injection could easily be hijacked by politicians aiming to 'Abolish The Fed', and the Fed would be politically vulnerable. However, this logic only offers limited solace to bond bulls. The size of the excess reserves (as of the end of October) is around $2.5 Trillion (required reserves are only $0.1 Trillion), based on the data in the Fed H.3 Report. Based on the H.4 Report, the Fed holds $4.2 Trillion in securities. As a result, the aggregate cost of carry of their portfolio is 60% of the interest rate paid on excess reserves. That is, the excess reserves would have to pay an interest rate greater than 1.67 times the average coupon rate of the portfolio for the net interest to turn negative. Moreover, if the Fed wanted to tighten policy rapidly, it could jettison its bond holdings, reducing the size of excess reserves relative to its overall portfolio. Additionally, the Fed presumably has some 'cookie jars' in its accounts that it could dip into. As a result, the Fed has a lot of latitude to raise interest rates before it will run into a negative carry position. As a result, the Fed may need to be careful of its accounting position during the rate hike cycle for the first time (that I know of), but this is not enough to stop rate hikes entirely.